The most inventive thing about Kenneth Branagh’s Cinderella may be that it’s not particularly inventive at all. That’s because it doesn’t have to be—it’s Cinderella. Branagh’s take on the ages old fairy tale is a handsomely made affair, but it’s the vein of self-assurance running beneath his aesthetics that makes his film feel vital. Rather than pop the hood on the story and retool its parts, he simply lets them be, tinkering with only a couple of mechanical adjustments here and there in the process (which are so minor that only purists might be bothered to discuss them). We consider narratives like this timeless for a reason, after all, and Branagh is smart enough to know that you don’t mess with a time-honored yarn without good reason. What we’re left with is a straightforward interpretation of the text: no new additions, no plot contortions, no revisionism. This is the saga of Ella (Lily James), a farm girl raised on courage and kindness by her parents (Ben Chaplin and Hayley Atwell), orphaned following their unceremonious deaths and left at the mercies of her horrible stepmother (Cate Blanchett) and stepsisters (Holliday Grainger and Sophie McShera, so hilarious together they deserve their own comedy hour). It’s up to the audience to decide if they can accept Cinderella for what it is, much as Ella asks her Prince Charming (Richard Madden, a standout in a supporting cast made up of standouts) to take her for the person that she is. Which probably sounds boring—but in practice, the film overflows with its own magic, the kind that only a gifted cast and crew can conjure on a studio soundstage. A large part of that comes down to Branagh. Like Cinderella itself, his direction here is decidedly classic, thankfully free of the Dutch angles that plagued 2011’s Thor and made with considerably more attention toward pacing than last year’s Jack Ryan: Shadow Recruit. He approaches the material with such deliberate care that his film comes to take on a storybook quality. Watching the picture play out is in a sense watching its pages turn and turn, each page gaining in momentous enchantment. Maybe Branagh knew there’s no reason to remake Cinderella for the screen beyond big box returns (if Maleficent wound up a smash, it’s an easy bet that this will too), and endeavored to make the best spectacle possible. Whatever the case, he’s succeeded in grand fashion. His best success with Cinderella, though, lies in casting. James, best known for her work on Downton Abbey as the sweetly naive Rose, is the soul of Branagh’s movie; he can claim credit for its technical merits, but without James it’s difficult to imagine Cinderella soaring as it does. She has the most disarming smile in the history of disarming smiles, a natural inclination toward charming warmth—Ella bears a stack of crosses, and James carries them, as well as the film, effortlessly without faltering in her portrait of grace under oppression. She’s a delight, and she makes everyone around her—including the capable Madden, whose presence here may make you fear for Ella’s life, or Blanchett’s immaculately thorny Tremaine, or Helena Bonham-Carter’s dingbat Fairy Godmother—look better just by sharing the frame with her. If the film has a flaw, it’s in computer-generated chicanery. Perhaps by necessity, Ella’s pivotal transformative moment is utterly soaked in CGI, and Branagh teeters on the edge between keeping us under his spell and completely shattering the illusion. Though he comes close, he never actually supplants the real spellbinding “stuff” of his film with technology, and before long we’re flitting through the dancing throng at the fateful egalitarian ball where Ella captures the Prince’s heart for good and all. That’s what we’re paying the price of admission for, anyways: not conventional, slightly overused (but admittedly lovely) effects but for the promise of true love united despite all obstacles stacked in its path. 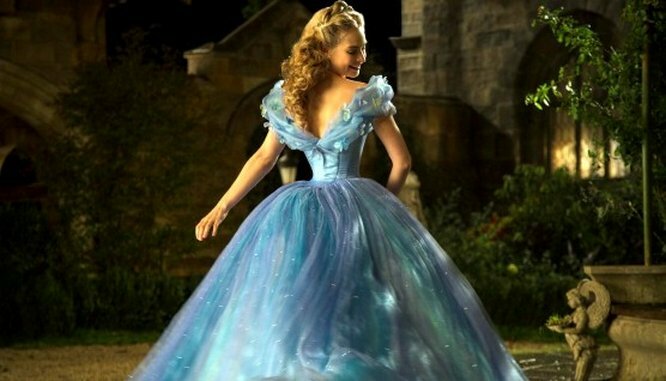 It hardly matters that we know where Cinderella will end up, or that Branagh has stuck with the basics. If he messes with the original’s components at all, it’s only by weaving in subtly robust feminist elements and setting the film against a multicultural backdrop where the realm’s nobility isn’t totally whitewashed. (Watching Nonso Anozie, playing the Prince’s Captain, dress down Blanchett is one of life’s simple, undeniable pleasures.) The rest remains as anyone acquainted with Disney princess fare or Grimm fables might remember it, but Branagh knows how to sweep us up in the ecstatic thrall of the familiar without breaking from fantasy or making his central messages about bravery, compassion and self-confidence feel superficial. It’s a major accomplishment for him, and hopefully a star-making turn for James. Boston-based critic Andy Crump has been writing about film for the web since 2009, and has been scribbling for Paste Magazine since 2013. He also contributes to Screen Rant, Movie Mezzanine, and Badass Digest. You can follow him on Twitter. Currently he has given up on shaving.